Ideal for the english rider and great for show! 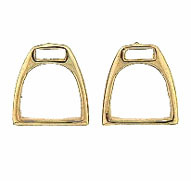 If you enjoy english riding and showing how about these english stirrup earrings. They offer a very bold look and fabulous three dimensional design but without the weight.